In your home, warm moist air from the living area moves its way into the attic and eventually works its way up to the roof ridge. Without adequate ventilation at the soffit line and/or from roof venting, the hot thermal air becomes trapped causing all sorts of problems. Poor ventilation in the attic promotes the formation of ice dams in areas that get snow. In the summer, heat bottlenecked in the attic can deteriorate the roof insulation, sheathing, and roof shingles. The most effective ventilation systems are a combination of soffit and roof ridge vents. 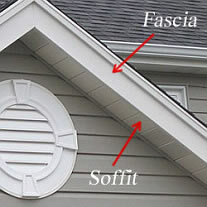 How often to vent the soffit line depends on the width of the overhang and how many square feet of airspace a particular soffit panel provides. Talk to your local contractor about installing the proper soffits on your house. . The strategy is to keep the hot convection air moving up and out of the roof area. Cool air is drawn into the attic through properly installed soffit vents, while the ridge vents allows the warmer air to rise and flow out the top of your home. To determine the amount of ventilation you’ll need, check the local building code. If you ever looked closely at a home built over a decade ago, you would have found most soffits and fascia were made of wood. However, while they may have been appealing to the eye, they were quick to erode when exposed to the harsh elements. Today, the most commonly used soffits are aluminum. A blend of solid and perforated soffit panels, in conjunction with aluminum fascia are used to reduce the amount of maintenance to be done on a home over time. It is the perforated soffit panels that provide the proper ventilation, which helps to reduce, overheating in summer and ice dam build up in the winter. The solid soffit panels add to the overall cosmetic appeal of your home, well forming a fire resistant barrier for houses built close to the property line. Looking to improve your homes ventilation and go maintenance free? Contact us today for a free quote on soffit, facia and all your exterior needs.